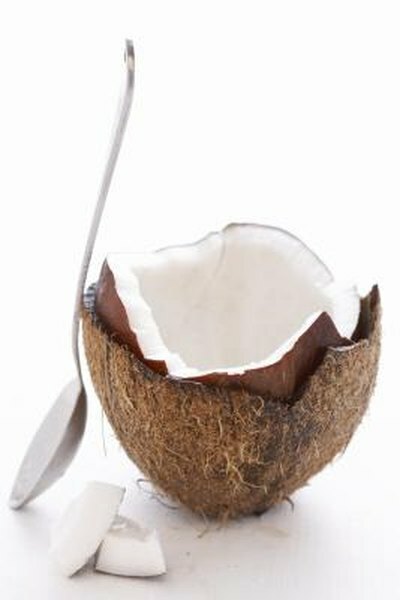 Coconut has been a central part of the diet and traditions of Pacific Islanders for centuries, in addition to being used as a traditional medicine. You can now easily get your hands on the goodness of coconut oil at most supermarkets and health food stores. Coconut oil is made by extracting the fat present in the flesh of coconuts. Virgin coconut oil is made without chemicals and is the most natural option. Coconut oil is rich in medium-chain triglycerides, or MCTs, a type of fat that could help dieters achieve their goal weight more easily. The MCTs found in coconut oil can promote weight loss in many ways, but revving up your metabolism is a big contributor. Studies have found that when a meal contains MCTs, humans burn more calories compared with when their meal contains long-chain triglycerides, which are the usual fats found in most vegetable oils, according to a March 2002 paper in "Journal of Nutrition." If you burn more calories and have a faster metabolism, weight loss will become easier. In addition, the fats in coconut oil appear to be more filling and more difficult to store as body fat compared with other fats and oils commonly used in the American diet. The MCTs found in coconut oil also have other properties that could benefit your overall health. Coconut oil is known for its anti-microbial properties, helping your body fight bacteria and viruses, as well as parasites, without creating a resistance as is commonly observed with antibiotics and other medications. Moreover, coconut oil has been associated with a lower risk of cardiovascular disease, reduced inflammation, and healthier skin and hair. The first step to lose weight with coconut oil is to replace all of your current fats and oils with the same amount of coconut oil. It is usually recommended to start using coconut oil in small amounts and to gradually work your way up. Dr. Bruce Fife, naturopath and author of the book "The Coconut Oil Miracle," suggests taking between 2 to 4 tbsp. of coconut oil a day, not only to lose weight, but also to benefit from all the different properties coconut oil has to offer. Cooking coconut oil is as easy as using any other types of fat. Coconut oil is usually solid at room temperature, or below 76 degrees Fahrenheit, but can turn liquid if your kitchen is warm. Replace your usual oil with coconut oil to saute your vegetables or cook eggs, chicken breasts, fillets of salmon or steaks. If you enjoy baking, substitute the fat in your recipe with the same amount of coconut oil, whether it is in granola, muffins, energy bars, cookies, pies or cakes.